Dental implants are posts that support replacement teeth. They fit directly into your jawbone and hold false teeth in place in the same way that roots support natural teeth. Implants are usually made of Titanium. If you look after your implants properly and maintain good oral hygiene, they should last for the rest of your life. 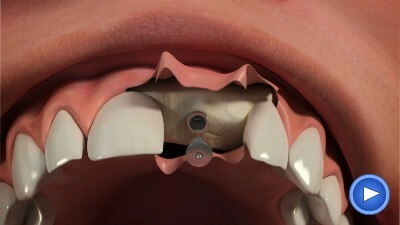 Having dental implants will involve at least one operation. You need to have healthy gums and your jawbone needs to be strong enough to hold the implants. After surgery to insert the implant, your jawbone will fuse with the Titanium rod. This takes several months. Dentures, crowns or bridges can be attached to the implant to replace your missing teeth. A single implant can support one or more replacement teeth. To replace all your teeth would require at least six implants in your upper jaw and between four and six in your lower jaw. If an implant has a screw-thread on its outer surface it can be screwed into position and if it does not, it is usually tapped into place. You can view examples of our work on our Implant Referrals page here. Referrals are carried out by Dr Raman Bhardwaj. 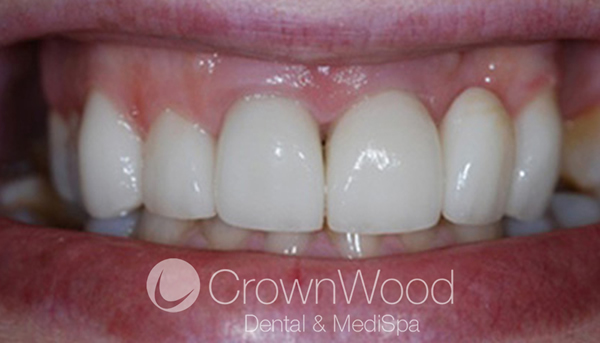 This patient had a combination of Dental Implants and Crowns fitted to create a beautiful smile makeover. Her treatment was completed with the help of our Dental Hygienist who assisted the patient in creating a simple cleaning and maintenance programme to help care for her wonderful new smile at home. 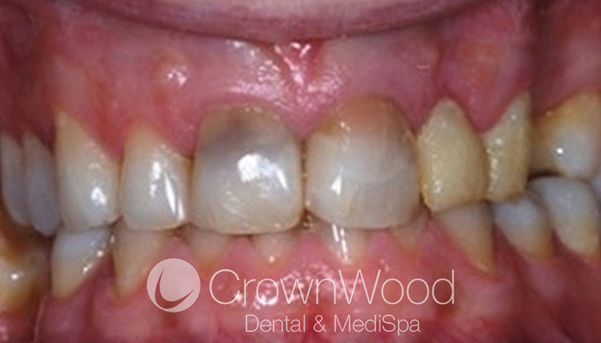 The patient is delighted and tells us she hasn't stopped smiling, and we are delighted to have helped. "The dental implantology work undertaken for me by Sach yielded marvellous results; far exceeding my expectations. I would recommend that anyone considering this type of treatment consult Sach before anyone else."